This project started out innocently enough, with the simple goal of providing a resource to students interested in the microbiology of fermented foods. 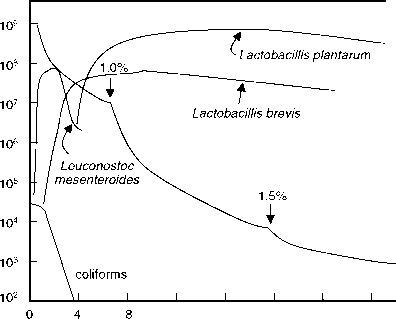 Since 1988, when I first developed a course in fermentation microbiology at the University of Nebraska, there has not been a suitable student text on this subject that I could recommend to my students. Peder-son's Microbiology of Food Fermentations had last been published in 1979 and Fermented Foods, by A.H. Rose, was published in 1982. Brian Wood's two volume Microbiology of Fermented Foods, published in 1998 (revised from an earlier 1985 edition), is an excellent resource and is considered to be one of the most thorough texts on fermented foods, but it and other handbooks are generally beyond the scientific scope (and budget) of most students in a one-semester-long course. Finally, there are many excellent resources devoted to specific fermented foods. The recently published (2004) Cheese Chemistry, Physics and Microbiology (edited by Fox, McSweeney, Cogan, and Guinee) is an outstanding reference text, as are Jackson's Wine Science Principles, Practice, and Perceptions and Steinkraus' Industrialization of Indigenous Fermented Foods. However, their coverage is limited to only those particular foods. I hope this effort achieves the dual purposes for which it is intended, namely to be used as a text book for a college course in fermentation microbiology and as a general reference on fermented food microbiology for researchers in academia, industry, and government. In organizing this book, I have followed the basic outline of the course I teach, Microbiology of Fermented Foods. Students in this course, and hopefully readers of this text, are expected to have had a basic course in microbiology, at minimum, as well as courses in food microbiology and food science. An overview of microorganisms involved in food fermentations, their physiological and metabolic properties, and how they are used as starter culture provides a foundation for the succeeding chapters.Nine chapters are devoted to the major fermented foods produced around the world, for which I have presented both microbiological and technological features for the manufacture of these products. I confess that some subjects were considered, but then not included, those being the indigenous fermented foods and the natural fermentations that occur during processing of various "non-fermented" foods, such as cocoa beans and coffee beans. These topics are thoroughly covered in the above mentioned texts. One of my goals was to provide a historical context for how the manufacture of fermented foods evolved, while at the same time emphasizing the most current science. To help accomplish this goal I have included separate entries, called "Boxes," that describe, in some detail, current topics that pertain to the chapter subjects. Some of these boxes are highly technical, whereas others simply provide sidebar information on topics somewhat apart from microbiology or fermentation. Hopefully, the reader will find them interesting and a pleasant distraction from the normal text. Finally, in an effort to make the text easier to read, I made a conscious decision to write the narrative portion of the book with minimal point-by-point referencing. Each chapter includes a bibliography from which most source materials were obtained. The box entries, however, are fully referenced.